Buenos Aires Properties: Apartments for rent and for sale in Buenos Aires. Best locations. Recoleta Buenos Aires, Palermo Buenos Aires, Puerto Madero Buenos Aires and San Telmo Buenos Aires. Capital Federal (The City of Buenos Aires) is the capital of the Republic of Argentina and has the country's most important urban center. The "Capital Federal" covers a surface area of 202 square km and is inhabited by around 3 million people. If you count the population living in the Greater Buenos Aires area it adds up to more than 10 million people, turning it into one of the 10 most populated urban centers in the entire world. The City of Buenos Aires was funded twice, the first time, in 1536, by Don Pedro de Mendoza. He was a Spanish settler who established the areas settlement and named it: "Ciudad del Espíritu Santo y Puerto Santa María del Buen Aire" (City of the Holy Spirit and Harbor Sait Maria of the Good Air). Later, in 1580, by Juan de Garay who renamed the city "Ciudad de Trinidad," but this new name never stuck with the people, who kept calling it the City of Buenos Aires, or Capital Federal. The temperature in Capital Federal has a yearly average of 64ºF (18°C). In the winters temperature varies between 37º (3°C) and 46ºF (8°C). Summer has an average of 82ºF (28°C). The people living in Capital Federal are often referred to as "porteños," alluding to the fact that the city of Buenos Aires was originally built around the city's port. Inhabitants living in the rest of the province are known as "Bonaerenses." Buenos Aires is also known as the "Reina del Plata" ("Queen of the Silver" "Plata" (Silver) referring to the main river in the area). It is an area that shines from the sheer amount of artistic expressions, that surprise both locals of Capital Federal as well as tourists visiting the City of Buenos Aires with a great variety of monuments galleries and art museums that can be visited in all the areas of Buenos Aires. The city of Capital Federal has some very popular areas within it, such as: San Telmo, Recoleta, Puerto Madero, Retiro, Barrio Norte, Belgrano, and Barracas, etc. These areas receive a lot of tourists in search of renting apartments for short term rentals in order to stay and get to know the city of Buenos Aires, Capital Federal. Other sites of interest and high historical value in Capital Federal are the "Cabildo" (Town Hall), the Cathedral, the Municipal Palace, the Obelisk, Colón Theatre, the "Manzana de las Luces" (Block of the Lights) and the "Planetario" (Planetarium). In "La Ciudad que Nunca Duerme" (The City that Never Sleeps), as Capital Federal is also known as, there are lots of activities to be done at night, including going to concerts, gigs, theatres, movies, or visiting the floating Casino, cafes, and pubs. Asides from its excellence in Bovine Meat, there is a variety of food with great Spanish and Italian influence. Argentinean wines satisfy the highest expectations and is of the highest quality. Wines produced in Mendoza are outstanding, and the province is also known for producing the best champagne in the country. Being the Center of the Countries activities, Capital Federal offers an almost unlimited array of possibilities for entertainment. 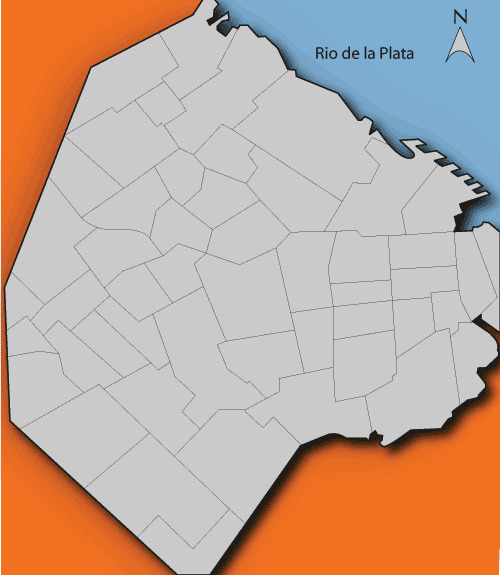 Capital Federal have the natural limits of the "Río de la Plata" (Silver River) and the "Riachuelo," to the East and to the South respectively. The General Paz avenue that goes around the city surrounds it from North to West and completes the city limits, connecting the city with "Gran Buenos Aires" (Greater Buenos Aires - Referring to the areas outside the Capital Federal). The official language of Buenos Aires and all Argentina is Spanish. One of the most distinctive aspects of the language is the use of Vos instead of "Tu," and also the use of "che" used when addressing some one familiar. "Che" usually demonstrates a kind of trust between people, and it is used to call someones attention without using their name. For Example; "Che, ¿Como estas?" translates to "Hey, how are you?" The typical beverage in Argentina is the "Mate," made by pouring hot water in a small container with the same name. The container carries "Yerba Mate" (mate weed). Some drink their mate sweet and add sugar, usually women, while the more traditional way is drinking it bitter, just the infusion of mate and water. Our service gives our users easy access to apartments in Capital Federal and other real estate properties, for either sale, rent or short term rentals. Our site advertises 24 month apartment rentals and apartments for short term rental in Capital Federal, Buenos Aires. These offer comfort and more privacy for your stay in the city of Capital Federal. In our site you will be able to find a great variety of apartments in Capital Federal, luxury and furnished, for short term rentals in the most exclusive areas of the beautiful city of Capital Federal. The price for the apartments in Buenos Aires published in this site, for sale, rent, and short term rental, are final and we will not be charging any additional fees to either the seller or buyer. To do a search for an apartment in Buenos Aires just register and you will have access to the contact information of the people publishing in this site, for free. If you are unable to find the real estate property or apartment in Buenos Aires that you are looking for, Let us do the search for you and we will be sending you apartments in Buenos Aires, that match the profile you send us, directly to your e-mail inbox. EnBuenosAires.com the site to Publish Properties and to find apartments in Capital Federal, Buenos Aires, Argentina. En Buenos Aires aims to make it easier, more effective and less expensive for estate agents working in the Buenos Aires area to market their properties to prospective tenants. It gives you a new alternative for marketing your properties and finding new clients, in a more direct and less costly way.